Paperfection's Art & Craft: Surprise! Easter Presents from Huismus! Surprise! Easter Presents from Huismus! Last weekend. 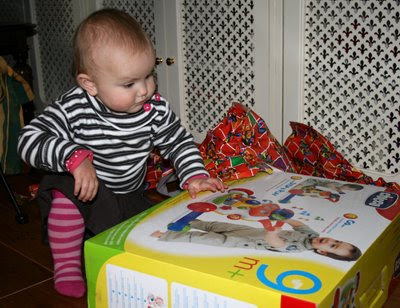 My daughter and I just arrived in The Netherlands and my parents threw Merlijne a big party for her first birthday. They served a massive cake with her picture on and had invited the whole family. Merlijne was, however, not the only one to unpack a pile of presents... ...because a suprise package had been delivered for mom too! 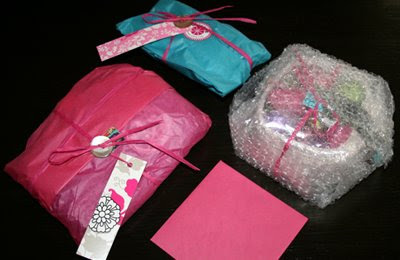 A box full of gorgeous Easter goodies! We´re taking part in the ´Secret Easter Bunny´, a gift exchange between European Etsy sellers organized and matched by ArtMind. My secret bunny benefactor turned out to be... sweet Simone aka Huismus! Recently, I got to know Huismus a bit when I tagged her to show 16 pictures about herself on her blog. I learned that she travels for work, adores her beautiful son and daughter, and that she loves the colour turquoise. 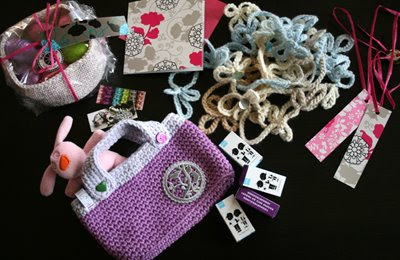 She crochets hats, bags and baby booties and makes beaded jewellery. Little did I know that she was probably already making me some wonderful gifts! With an injured wrist she crocheted me a basket and filled it with chocolate eggs. She created a summer flower scarf for me in soft pastels AND made Merlijne a cute little handbag with handles, buttons, a little bunny and raisins. All presents were beautifully wrapped, tied and labeled with Huismus stickers and tags and there was a sweet hand-written card saying it puzzled her that I live in Spain but love to wear scarves! Just like I mused over the fact that a stewardess calls herself Huismus (a house sparrow but also someone who loves to be at home). Thank you so much Huismus, thank you ArtMind! You're so welcome Elzeline, I really enjoyed making it all..and I'm really glad you like them. How cute are the pictures of Merlijne with her mini purse, just adorable! oooh, what an adorable little girl she is!! and such a beautifyul collection of easter bunny gifts!! well done .. lovely photo's and post! Lucky bunny you are! What wonderful gifts!